ASP.NET version .NET 1/2/3/3.5 and framewrok 4.0. Although Linux is the most preferred option in reseller hosting, Windows is still the first choice of a big number of online users. It is popular because it is user friendly and it is a trusted brand that has been used for a long time. Please note that some web solutions are only possible to access through Windows hosting. Windows reseller hosting is ideal for those who have websites using windows based applications. This will provide compatibility to those applications with the web server. Windows reseller hosting will work wonders for those who prefer ASP, ASP.NET, Microsoft SQL Server or MySQL database for their website and server. 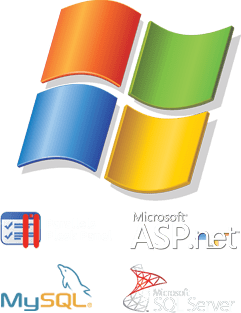 Each of our Windows reseller hosting accounts comes with Parallels Plesk control panel. The easy to use user interface and several web based tools makes hosting easier for you and your customers. This saves you time and money, while giving your customers a beautiful hosting experience. You can create, edit and manage a web hosting space with just a few clicks. It does not require you to be technical, as even a novice can manage things very easily. It contains more than 200 web applications and CMS. This panel is being used by a broad range of users like; web hosts, web designers, small businesses, IT professionals, etc. In whole, it lets you manage how the server and associated resources will be used. Scalability: Our windows reseller hosting is focused on scalability to improve the server's performance, as scalability and future expansion cannot be neglected while hosting a Windows application. Easy to Use: Windows has been used worldwide for a long time, so most people are familiar with Windows operating system. If you know how to operate windows you can easily manage windows based server, as there will not be any need to learn a new language to manage your website. Updates: Microsoft keeps updating the features and functionalities of Windows operating system from time to time. This gives you an opportunity to get updated with the latest technologies and recent changes. Join Everdata Technologies as a Windows hosting reseller. To do so, please reach us by starting a chat with us, or contacting us through an e-mail (sales@everdata.com), or making a phone call (+91-141-3000000) on land-line number in India. Everdata Technologies is rated 8.2 / 10 in 11 reviews on TrustPilot.Com. Have questions about hosting with EverData?